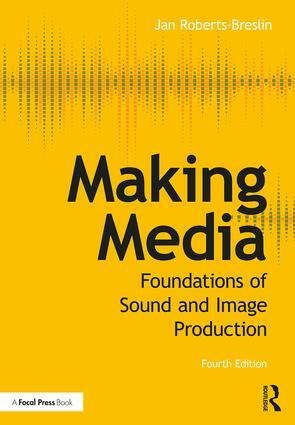 Making Media: Foundations of Sound and Image Production takes the media production process and deconstructs it into its most basic components. Students will learn the basic concepts of media production – frame, sound, light, time, motion, and sequencing – and be able to apply them to any medium they choose, from film and television to fine art and online applications. They will also become well-grounded in the digital work environment and the tools required to produce media in today’s digital environment. This new fourth edition is completely updated and includes a new chapter on the production process and production safety; information on current trends in production, exhibition, and distribution; and much more. New topics include virtual and augmented reality, the use of drones and new practices interactive media. The text is also fully illustrated and includes sidebar discussions of pertinent issues throughout. The companion website has been completely revamped with interactive exercises for each chapter, allowing students to explore the process of media production. Jan Roberts-Breslin’s Making Media is an excellent primer for the introductory media production course. She weaves a comprehensive roadmap for the budding media artist from concept through execution to distribution. A valuable addition to media production instruction. Jan Roberts-Breslin is a media artist whose video art has been screened and won awards at U.S. and international film and video festivals, aired on PBS, and exhibited at museums. She is a Professor of Visual and Media Arts at Emerson College in Boston, where she was the Founding Director of the MFA in Film and Media Art, and currently serves as Dean of Graduate and Professional Studies. She has been a Visiting Scholar at the Communications University of China in Beijing.